Crocodile and snake show that takes place every day! 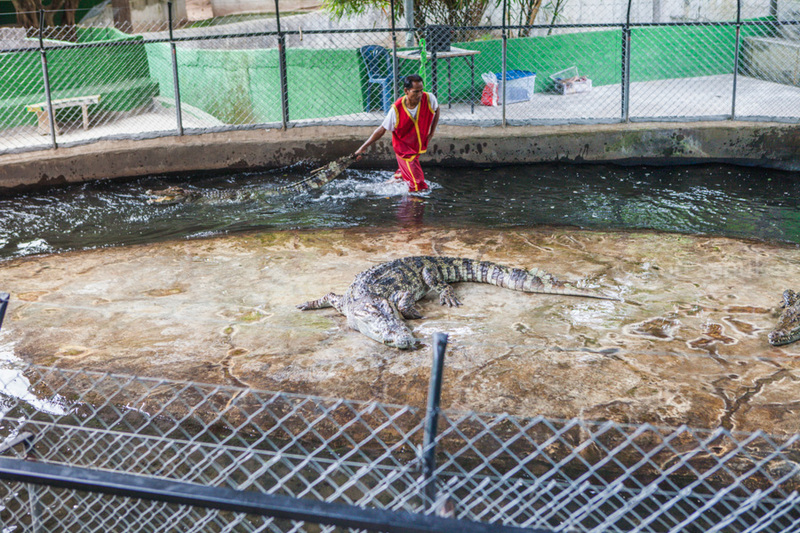 If you want to get acquainted with reptiles – crocodiles and snakes, we would like to invite you to Crocodile farm that is located not far from the Samui airport. 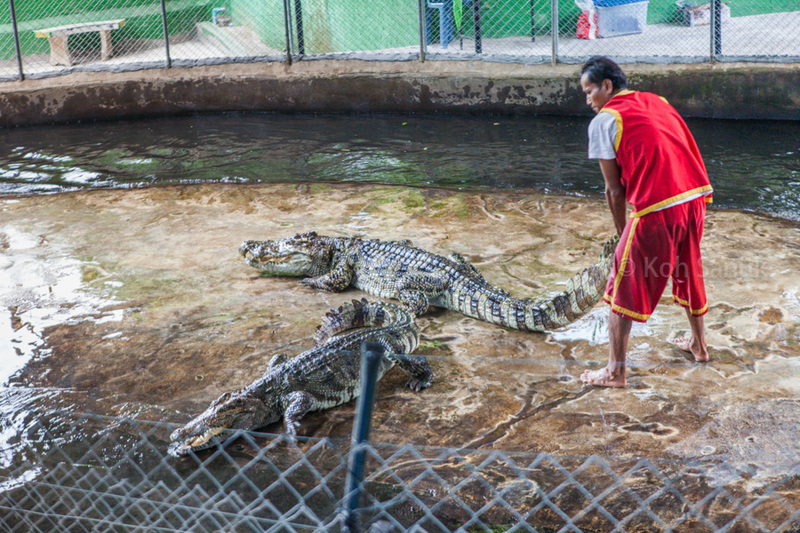 Crocodile shows run 3 times a day (at 12:00, 14:00 and 16:00) and is followed by shows of snakes. You can book only tickets to the show or tours with the transfer. The show of crocodiles is very fascinating and thrilling. 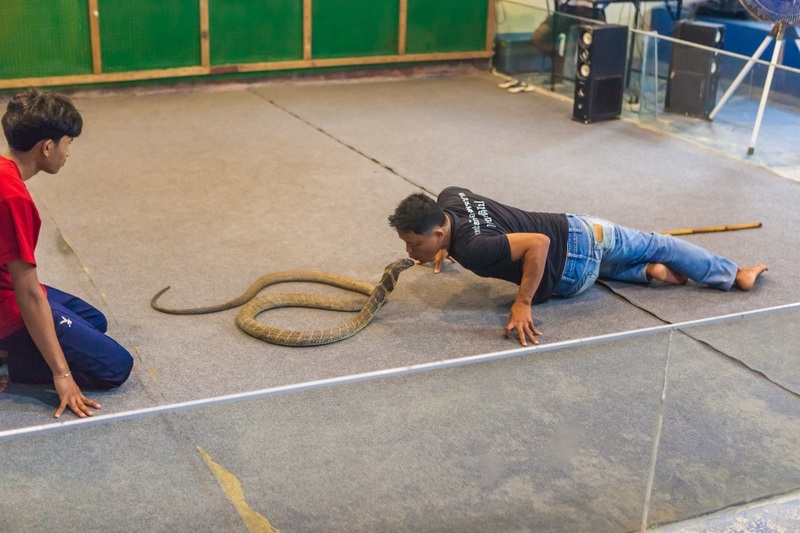 Thai trainers perform complex, exciting and very dangerous tricks – catch predators by the tail, put their hands and heads in their mouths and amuse themselves with them like with pets. Crocodiles are can’t be trained, and it’s simply impossible to teach them any trick. The behavior of the reptiles is instinctive and depends on the environment (such as temperature, humidity). The show takes place in an indoor pool with a concrete floor and water along the perimeter. It’s rather cool here, which slows predators a bit and gives the trainers an advantage. First of all, after entering the platform, young people pour themselves and the floor with water from the pool. The secret is that crocodiles extract a special enzyme in water, the smell of which mixes with the smells of the environment and does not let the animal know that the prey is around. Throughout the show, pouring with water is repeated several times. Crocodiles have an excellent sense of smell, but poor vision. Then the trainers need to choose the animal that will participate in the show. 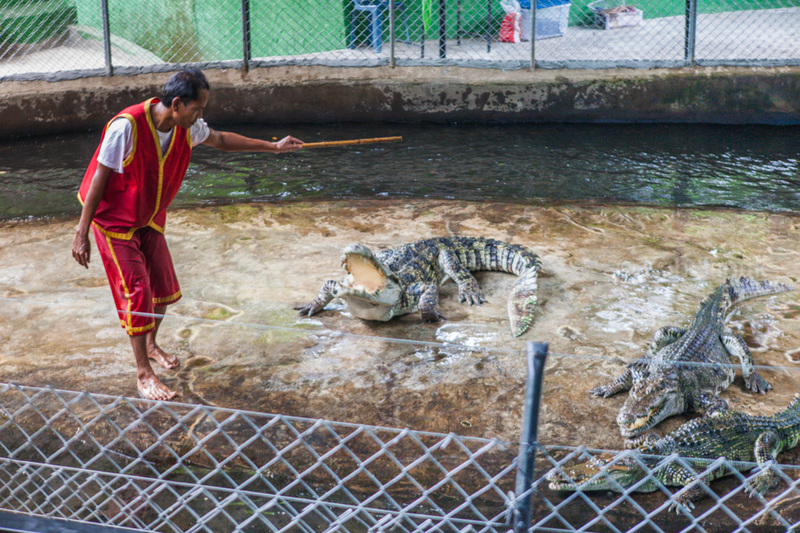 They start pulling the reptiles from the water by the tail, you think that the show is already in full begun – no, the crocodile that behaves aggressively will not take part in the show. For a successful presentation, it is important to choose a calm animal. So, the crocodile is chosen. 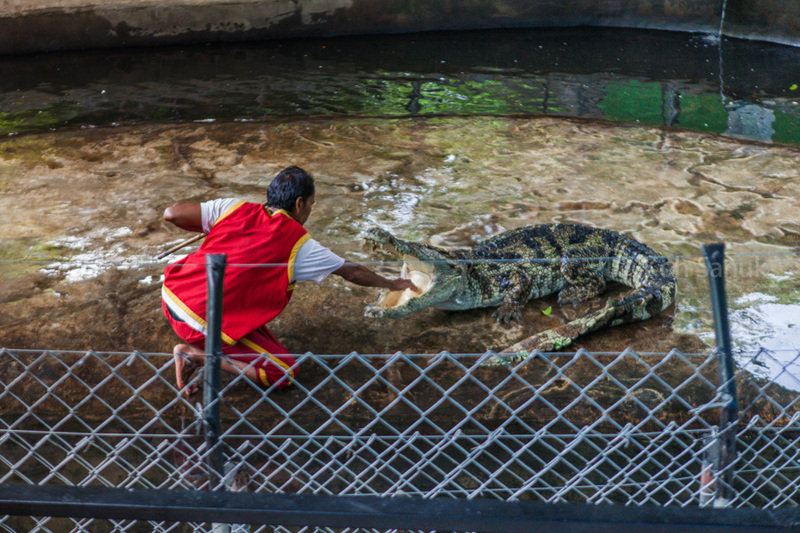 The trainer takes a stick out of the water (without foreign smells) and touch the teeth and graze of reptile. These movements are similar to movements of birds that clean the remains of food from crocodile’s teeth. The predator, realizing the benefits brought by the birds, will never shut the mouth with the bird inside. When the crocodile wants to close the jaw, first a deaf click of the jaw joint is heard, the trainer has a moment to pull the arm or head out of the deadly trap. Slamming the jaws with prey, the predator begins to rotate around its axis, tearing the captured part from the body. 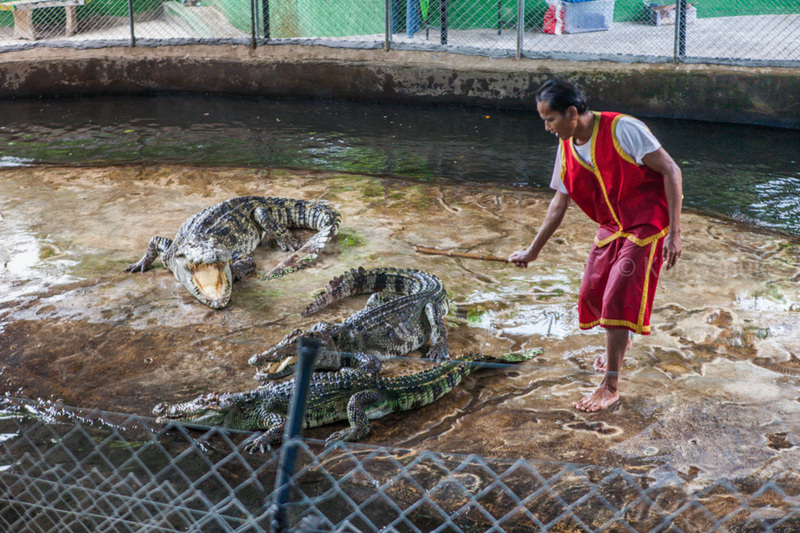 After each crocodile show, 30 minutes snake show takes place, the fee is included in the entrance ticket. 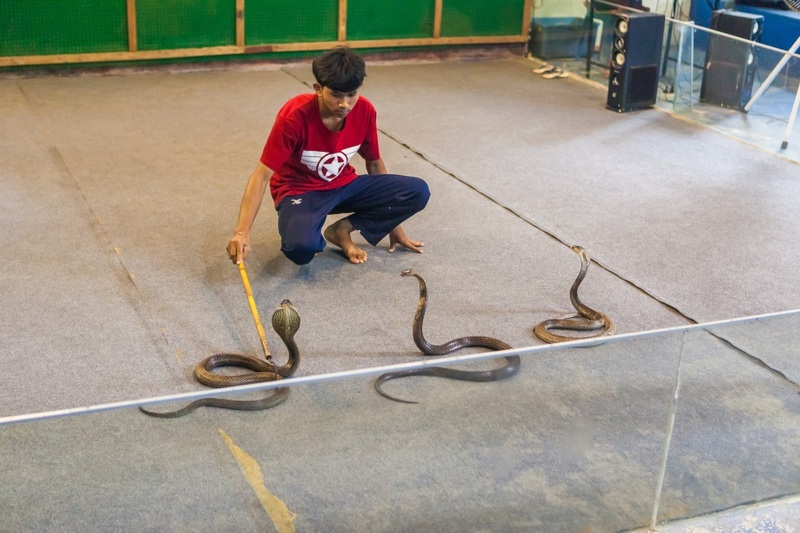 During the show, snake charmers demonstrate their skill of treatment with these venomous creatures and show various kinds of snakes that live on the territory of Thailand. Besides crocodiles and snakes, there are giant lizards, iguanas, monkeys, and other animals. The following information will make your acquaintance with crocodiles more interesting. The word “crocodile” was borrowed from the Greek word “krokodilos” that means “pebble worm”. Probably they called so the reptile whose bumpy skin looked like a pebble but its long body and movements resembled the worm. Crocodiles are one of the few surviving representatives of the subclass of archosaurs, and their closest relatives are birds who are also descendants or relatives of archosaurs. By the way, dinosaurs were included in a subclass of archosaurs. The huge jaw of the crocodile has teeth reaching 5 cm in length. The number of teeth varies from 72 to 100 depending on the species. The heart of the crocodile is four-chambered, and in the reptilian blood, there are effective antibiotics that prevent infection from damage or from dirty water. Thick-walled, muscular stomach contains gastroliths – special stones that help to grind food and give the body a balance while swimming. Crocodiles are growing throughout life. In nature, crocodiles live 80-100 years. 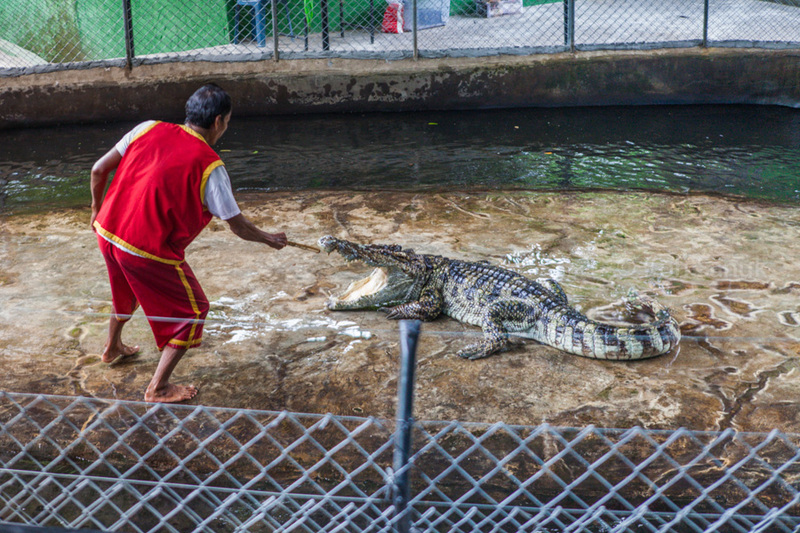 We went to the Samui Crocodile Farm to see the Crocodile and Cobra Shows. 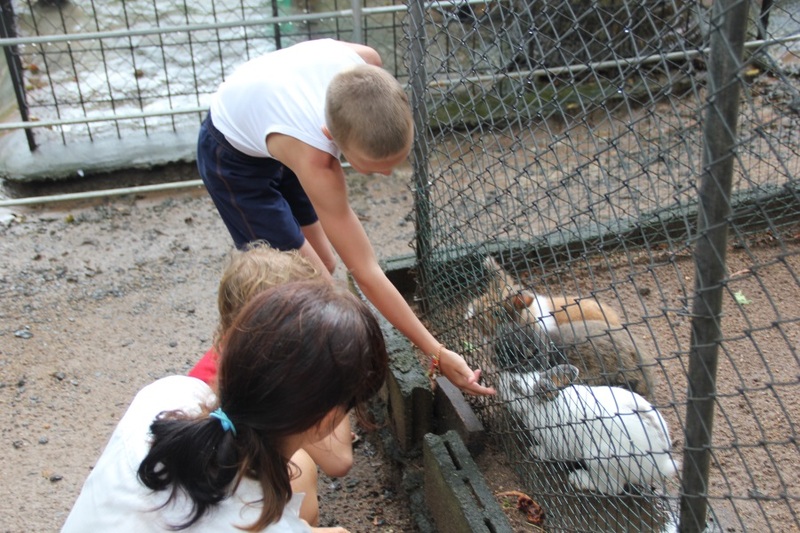 They also have a small zoo on the property with monkeys, reptiles, and birds. 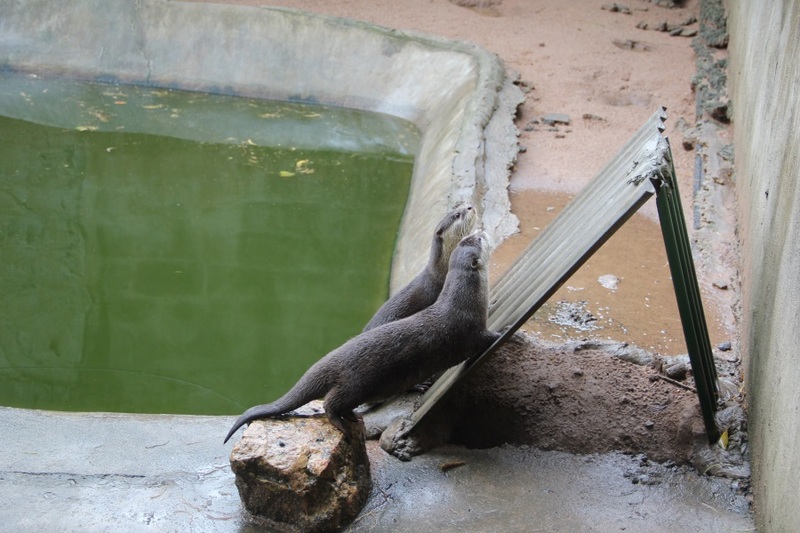 The zoo was not impressive by first world standards; however it seems like they are doing the best they can with what they have. The shows were great and everything is VERY up close and personal! It was definitely a thrilling experience that gets your heart pounding. Our favorite was the cobra show! The handlers are genuine snake handling experts. The snakes are still venomous and are not artificially cooled prior to the show to make them slower. There were some parts of the show that people were so nervous they moved back a couple rows. 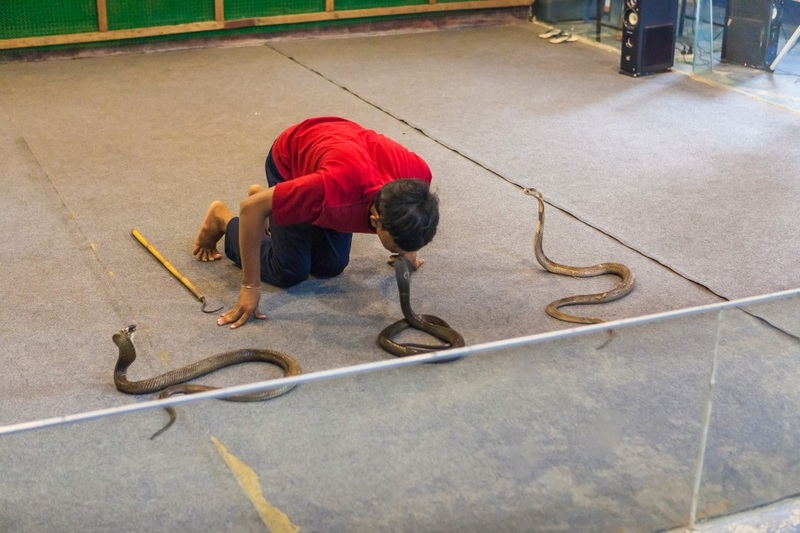 If you have ever had the strange desire to touch a king cobra – here is your chance. 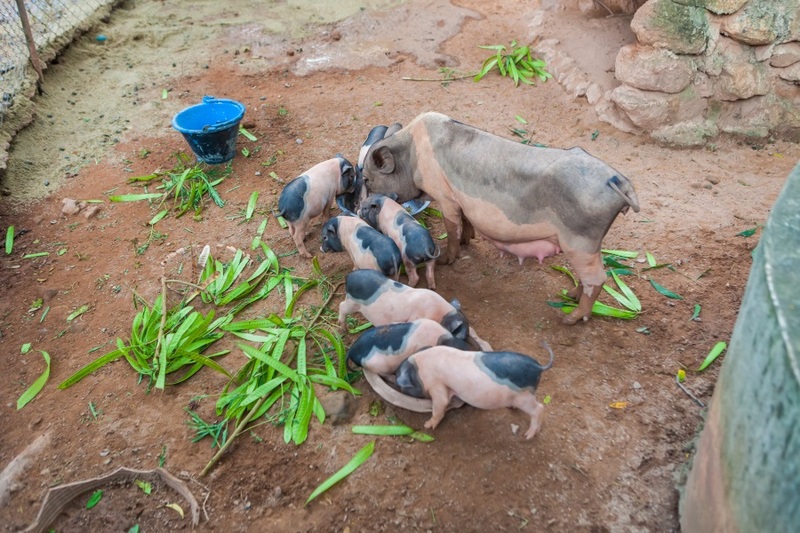 Towards the end of the show, one of the handlers allows guests to touch the back of one.